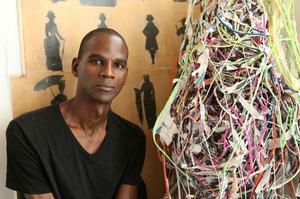 The High Museum of Art, Atlanta, GA., announced contemporary artist Mark Bradford the 2016 recipient of the David C. Driskell Prize on February 18, 2016. Named for the renowned African-American artist and art scholar, the Driskell Prize was founded in 2005 as the first national award to recognize an early or mid-career scholar or artist whose work makes an original and important contribution to the field of African-American art or art history. Bradford will be honored at the Driskell Prize Dinner at the High on Friday, April 29, 2016, at 7 p.m.
Based in Los Angeles, Bradford is known for his monumental, abstract collage works, which feature intricately layered forms and lines created using found materials such as string, carbon paper and billboard paper. In his paintings, installations and sculptures, Bradford explores how socioeconomic and political forces converge to shape the diverse culture and physical environments of urban communities. Bradford’s work has been featured in more than 40 solo exhibitions over the past two decades and is included in the collections of distinguished institutions such as The Guggenheim, the Walker Art Center and the Los Angeles County Museum of Art. The selection process for the 2016 recipient of the Driskell Prize began with a call for nominations from a national pool of artists, curators, teachers, collectors and art historians. Bradford was chosen from these nominations by review committee members assembled by the High, which included Andrea Barnwell Brownlee, 2013 Driskell Prize recipient and director of the Spelman College Museum of Fine Art; Valerie Cassel Oliver, senior curator of the Contemporary Arts Museum Houston; and Lauren Haynes, associate curator, permanent collection, The Studio Museum in Harlem.